You’ve made dinner with your Instant Pot – now try it for breakfast! 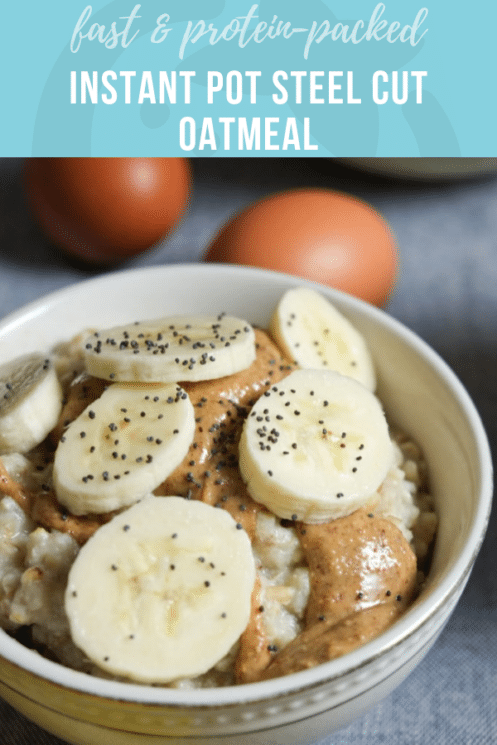 Protein packed Instant Pot Steel Cut Oatmeal with eggs tastes like regular oatmeal but has a protein boost and is extra creamy. Serve it sweet or savory – it’s totally versatile. Have you ever added an egg to your oatmeal? If not, you really should. 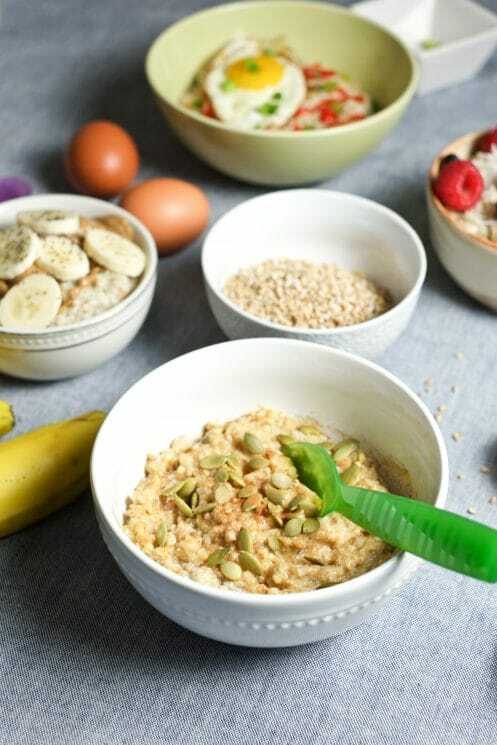 Cracking an egg into your oats and cooking it in porridge itself adds protein and extra creaminess. You won’t even notice there are eggs – and neither will your kids! Now of course this can be done on the stove, but what about in the Instant Pot? I was a little wary of trying because I couldn’t find any recipes online, so I thought perhaps it just didn’t work… but it does! 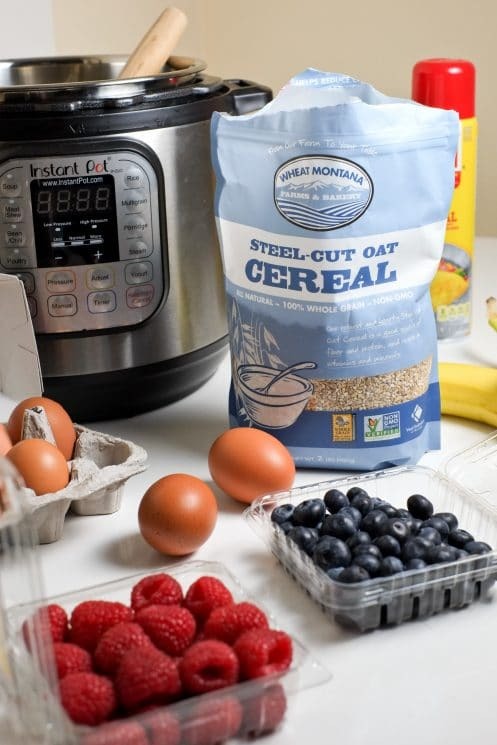 We love cooking steel cut oats in the Instant Pot because there is absolutely no fuss! No constant stirring and babysitting, no boiling over. It’s pretty amazing. 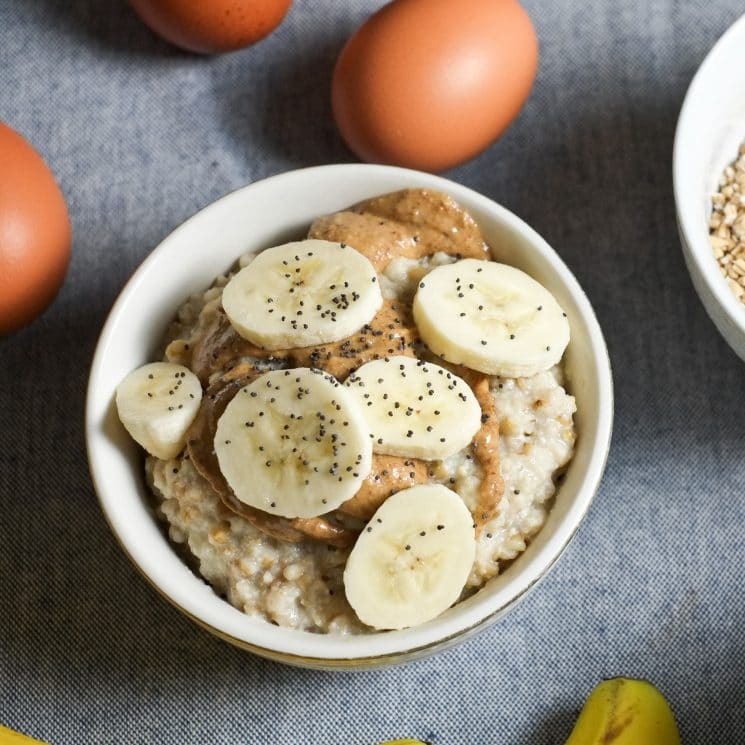 If you end up not adding an egg to your oatmeal, you can use these instructions (sans eggs) to prep it all the night before and set the timer so it’s done when you get up. Amazing! 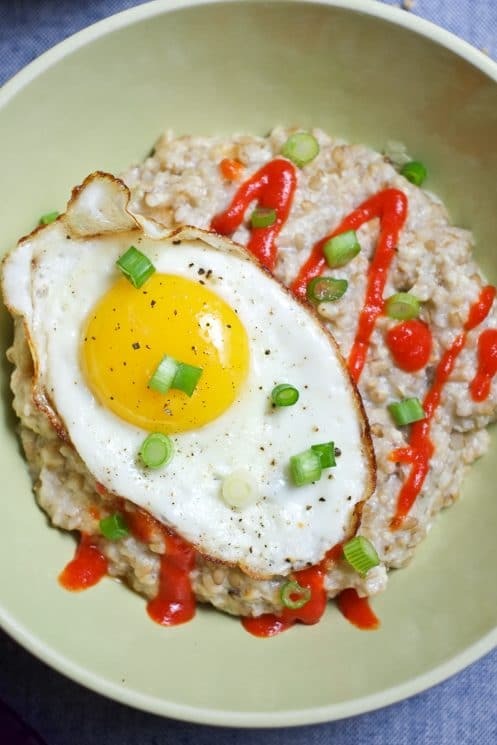 So why add an egg to your oatmeal? Steel cut oatmeal is already a wonderful breakfast food. This whole grain has lots of fiber and quite a bit of protein to keep you satiated. So why add eggs? Eggs add extra protein that will keep you full even longer! We all need that extra staying power, especially kids! Eggs also have extra vitamins and minerals important for brain development and bone health. Plus, they just make the oatmeal so creamy! And of course, you can still add an egg on top, too, if you want. It’s actually delicious. And don’t worry, you can’t taste the eggs. 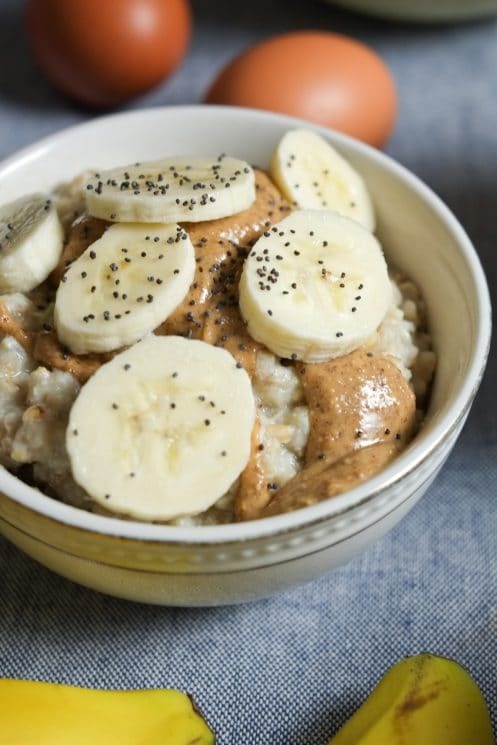 You can still make this oatmeal like you would normally. We’ve added two eggs to a four-serving batch, but I am sure you could increase the number of eggs if you don’t mind noticing the eggs just a little more and want the extra egg protein. First rule – don’t use dairy milk! Milk scalds during pressure cooking, so just use water or a milk-substitute (like almond milk). I used water and it worked just great. Other than that, this recipe is pretty foolproof. Begin by spraying the bottom of the Instant Pot bowl with cooking spray. Next, crack two eggs into the bowl and dump three cups of water on top. Whisk really well so that the eggs are well distributed. Finally, pour in 1 cup of steel cut oats and a pinch of salt. Give it all a little stir. Set your Instant Pot to “Manual” and make sure it’s on high pressure. Adjust the time to 3 minutes and then you’re good to walk away! Oh, and don’t forget to make sure the vent is closed. Note: if you prefer oats on the soft side, set your timer for 5 or 6 minutes. 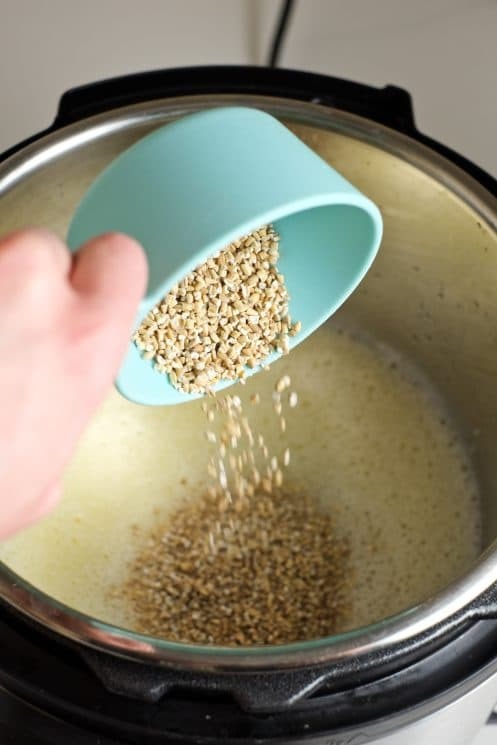 I like steel cut oats because they have a little “bite” so I cook mine for 3 minutes – they are fully cooked at that point but not mushy. The pressure should build in about ten minutes, then cook for 3 (or whatever you selected), then it will take about 15-20 minutes for the pressure to release. So go ahead and shower or whatever. No need to stir like regular stovetop oats! If it’s convenient, try to push “Cancel” after the pot is done cooking (it will beep). This will help the bottom of the oatmeal avoid any risk of burning on the “keep warm” setting as the pressure releases. I have done it without cancelling and it was fine, but I have heard it can burn a bit – so just a heads up! Important: do NOT try to manually release the pressure! This could cause sputtering and clog your vent, which can potentially ruin your new device. Instead, just let the pot sit for 20 minutes until the pin drops. When first opened, the top of the oatmeal will be covered in egg froth. Not to worry, just give the pot a good stir and it will mix together nicely. At this point, can flavor your oatmeal as a big batch if you like – with sweet potato, cinnamon, maple syrup, even a little milk, etc. Serve with whatever you love on oatmeal! I tried a few variations here: maple pumpkin, coconut berry, peanut butter banana, and even a savory one with an additional (fried) egg, sriracha, and green onions. Spray Instant Pot with cooking spray. Add eggs and water and whisk really well. Add in oats and a pinch of salt and stir. Seal the lid and close the vent valve. Push the “Manual” button, set to “High” pressure, and set for 3 minutes (or 5 if you like them softer). The pot will take a few minutes to reach pressure, then cook for 3 minutes, and then beep. Once it beeps, push “cancel” so the pot doesn’t automatically go to the “keep warm” setting, which might scorch the oats. Allow 15-20 minutes for a natural pressure release before opening the lid. This is important to keep the foam of the oats from sputtering and clogging the vent if you tried doing a manual release. Once the pin drops you will know it is safe to open. Open the pot, stir well, and serve with favorite toppings: a splash of milk, honey, cinnamon, nuts, and fruit – just to name a few! 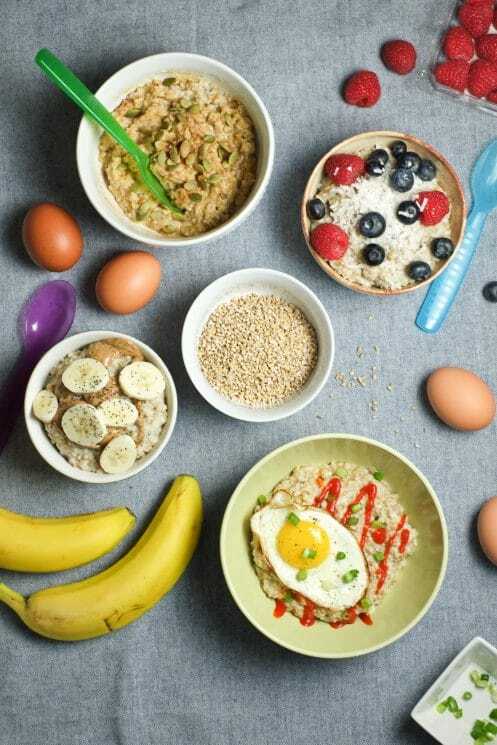 I would love to incorporate eggs into my daughter’s daily oatmeal (we usually do rolled oats) but I don’t have an instant pot. Any suggestions for doing this on the stovetop or slow cooker? Thanks! I have good news! This works great on the stove top. Prepare the oats as directed on your package. 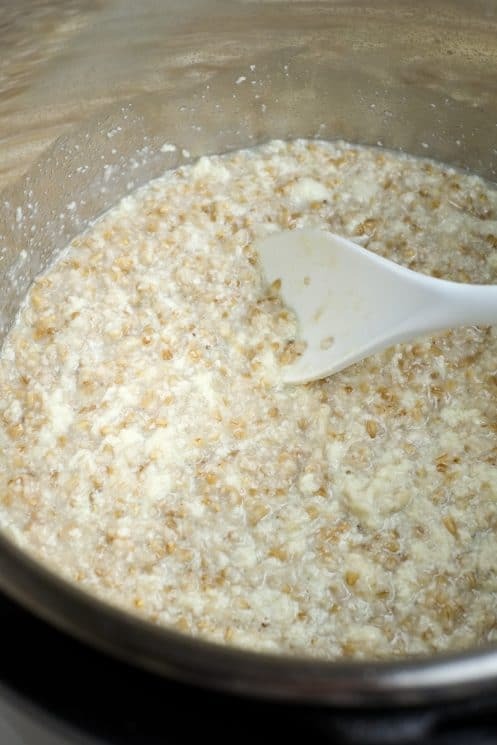 Once your oats are basically done cooking, crack the eggs in and stir for a minute or two until they’re cooked. It’s kind of magical to watch them get creamy right before your eyes. As for the Crockpot, I haven’t tried it, but I wouldn’t be surprised if it works the same way as the instant Pot, just adjusting liquid ratios according to what’s needed for the slow cooker. If you try it, let us know! Can you make a double recipe of this in the 6qt instant pot? You should have no problems. The rule is not to fill it more than halfway with expanding things like oatmeal, and since this recipe doubled would only be around 8 cups that’s less than half of six quarts. I might just add a teeny bit less water because it seems like bigger recipes usually have slightly less liquid. Hope this helps! I did try a double batch and you’re right – it needed significantly less water as it was really soupy. Thanks! Good to know! Yeah, it comes out a tiny bit soupy with the original recipe and soaks up the extra water as it sits, so with a bigger batch I can imagine it would be too much. Noted for the future! If I made a double batch would I have to increase the cooking time or would 3 minutes be enough? Hi! So glad I stumbled upon your page!! Not only are these a great way to get kids to eat eggs, it works for adults too! I meal prep for some coworkers and I can guarantee this is going to be a hit! My question: How many servings does this yield? Thanks in advance! Yes, I definitely love this as an adult! It makes 4 filling servings, a heaping cup each I think it ends up being. First my kids LOVE this!!!! And I love that it is healthy and gets eggs in them! how do you recommend storing leftovers? i want a big batch that i can serve my toddler for breakfast through the week. Loved this! If you hit the manual button twice before selecting the minutes, the IP will shut off the warm feature so you can walk away without worrying about burning them. I have been making this recipe on Sundays using 4 egg whites, cinnamon and liquid stevia and meal prepping for breakfast on the go for the week. Works great! Thanks! I LOVE this recipe, but have had some difficulty. Initially it came out perfectly. Now the pressure never really builds up so they don’t cook and the lid can be taken off at any time since the pressure isn’t building. My IP seems to be working fine with other recipes. Any suggestions? Have you tried this in serving size canning jars ? We use mason jars for our steel cut oats all the time! They work great for storing in your fridge. I noticed the bag of Wheat Montana oats! I’m curious if you are a fellow Montanan?